Who do you think you are? My family tree history. This Easter I took advantage of free weekend access to Ancestry's website. After a lot of digging and cross referencing I finally found the evidence that Dad's mum's uncle was a Labour MP called Davie Logan, 1871-1964. I was told this about 10 years ago by her sister, but it was her son, my dad's cousin who posted this fact on a forum. It turns out that he was the leader Liverpool Labour Party and had a tower block named after him in his local area (Vauxhall Liverpool 5, otherwise known as Scotland/Scottie rd). 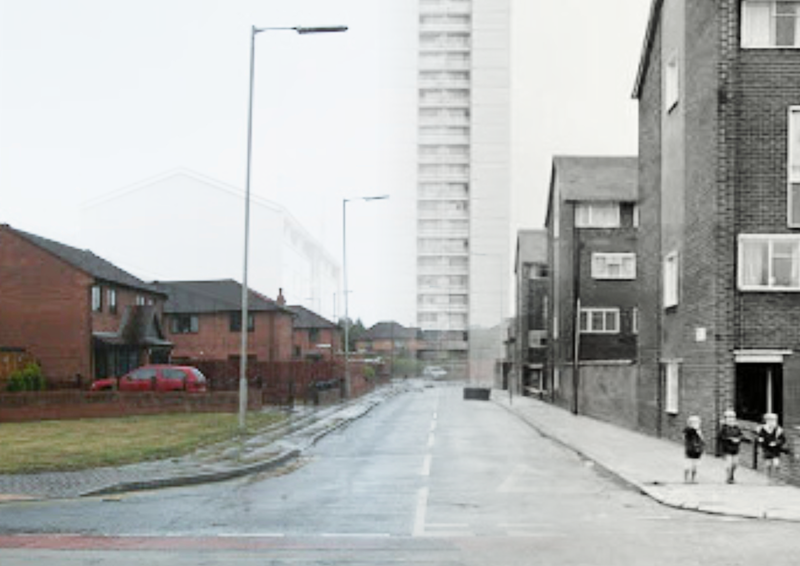 This tower block has since been demolished. Housing in this part of the world, seems to either be a 100 years old or demolished after 30 years. I was born in 1970, so I never got to see either so I did some sleuthing and put the photos together, this way you can see how things have changed over the years. Just wondering, is there a better way of doing this in AD, as I haven't got APh? Very imaginative and creative work. I like this a lot. Thanks, i've seen something like this before and yes, I do like Sapphire and Steel and Time Team.